Welcome to the home of the Valley Soaring Association (VSA). “Valley” in the title refers to the Sacramento Valley, which is the northern portion of the great central valley of California, USA. “Soaring“ is what we do in non-powered aircraft. Ships that look just like small powered airplanes, but we don’t have motors. We locate rising currents of air, climb in them, and then glide to the next bit of rising air, usually staying aloft for many hours at a time. The “Association“ we have formed is a group of people with the common interest of flying gliders, otherwise know as sailplanes. 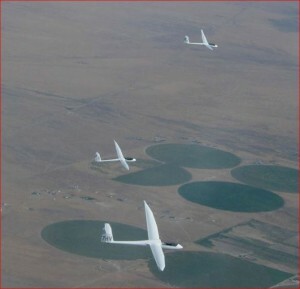 Thus, the Valley Soaring Association is organization of pilots who share the love of the sport of soaring. 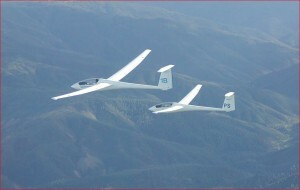 The glider is pulled into the air by a rope connected to a powered airplane. Typically it takes about 15 minutes to be towed to an altitude of about 5,000 feet, where we then release the rope and start gliding. Climbing in the rising air currents, we often travel hundreds of miles on a single flight, often climbing to the bottom of the clouds and then gliding to the next thermal. Even on clear days with no clouds, we climb upward to altitudes of over 10,000 feet. But, gliding is about social activity as much as it is about learning and enjoying our flying skills. Browse the pages on this web site and you will see we have organized races, teaching, learning and sharing seminars, weekly BBQs, banquets, etc. There are no restrictions to membership, and everyone is welcome to join. The active membership of VSA has varied over the years since we were first organized in 1987. In the earlier years we often had over 200 active members on our roster, but we seem to have stabilized in the past ten years or so with an average of about 45 regular members renewing each year. Since the vast majority of pilots are tech savvy, they use their smart phones about as often as they use a computer for visiting or browsing the web. For now, these web pages will remain on the servers for browsing and as a source of archived info, but our primary web page is simply not much more than an index page on where to find the old pages. The pages listed on in the column to the right are maintained as record copies of our old pages. Visit the Form/ Williams Today to see the latest news:..
You are welcome to visit all of our many web pages and thanks for visiting our site. Contact our current club Secretary, Cora, and join today if you are interested. We’ve been around since 1985 ( starting in Vacaville, California ) and have migrated to the northern part of the big Central Valley – Sacramento Valley. 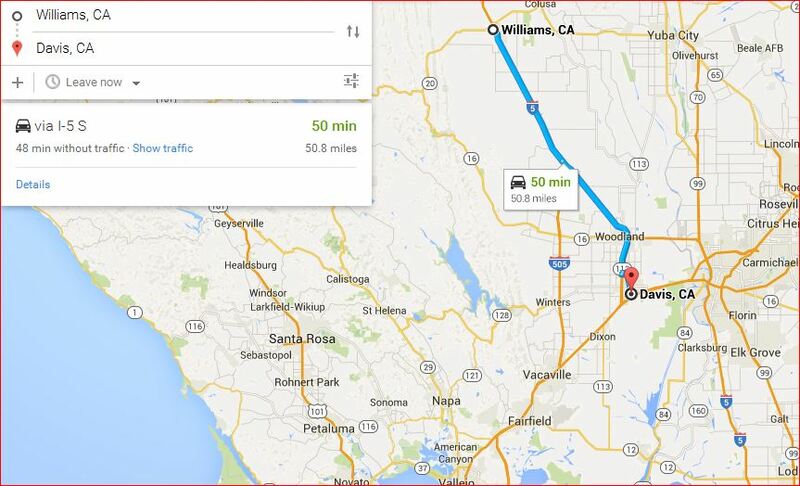 We now operate from Williams, Ca. See more about our current location below. Browse a bit and see the photos and read the stories – you’ll soon learn what we’re all excited about. Although many pilots of the association also fly from various other glider ports throughout California and Nevada, we all have have a common interest in the Williams Soaring Center, located in Williams, California, about 45 miles north of Sacramento, along Interstate Highway 5. It might be easier to show you a Goggle map. Williams is located along I-5 at the intersection of Highway 20. The city of Davis is located along I-80 to the south. Sacramento, the capital of California is 15 miles east of Davis, and San Francisco Bay Area is 50 miles to the southwest.